What Kind of Jobs is the Mastercool 59161 Good For? A manifold gauge is an essential tool for working on HVAC systems. Here we’ll review Mastercool’s Two-way Manifold Gauge model 59161, one of your options for this essential service and diagnostic tool. This gauge is one that will help you read pressure accurately while dealing with HVAC systems. For those who like the age-old analog pressure reading system and enjoy owning a rustic gauge, this is the one for you. 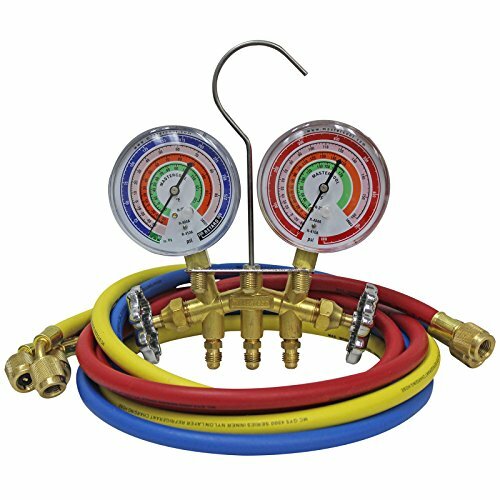 The Mastercool 59161 Two-way Manifold Gauge Set is best for residential jobs. It will definitely help you diagnose gas and liquid leaks and to go through a basic service call. It is a professional piece of equipment, but may not hold up to commercial needs. This is a great addition to your toolbox if you more of a DIY person who would like to monitor and check your air-conditioning and refrigerant systems. It comes with 3 1/8" Gauges, 3-60" Hoses and Standard 1/4" fittings. The gauges can be easily recalibrated in the field to maintain accuracy. The exterior is made of brass, making it a long-lasting tool. The 3 1/8″ silicone-dampened gauges (PSI, ˚F) in this product ensure smooth needle movement. Also the free-floating piston-type valves reduce the wear and tear on the O-rings. For servicing a machine, you can also use this to remove contaminated or unknown blend refrigerants from the air conditioning system, reducing the chance of cross-contaminating a service machine. It also comes with a hose holder for convenient storage. This is probably the device’s strongest point. While it’s not a high-end manifold gauge, it’s still a good deal for the price. The heavy-duty forged brass body keeps the tool from rusting as it is exposed to different gases and liquids. Brass is used all through the exteriors and so the reaction to chemicals is minimal. This brass piece is known for having minimal leakage issues. This gauge comes with quick-release connectors to avoid freon loss on high-pressure disconnects. Nothing is perfect, not even this gauge set. There are a few aspects you need to consider before purchasing this piece. They’re very minor, but of course we still want to present them. No owner or user manual is included with this piece of equipment. Of course, most technicians are going to know how to hook up and read a gauge,so this isn’t generally a big issue. In fact, it’s a legal requirement that anyone servicing a system is properly licensed. If you just need some hints, you can check this simple guide to using a manifold gauge that will come in handy if you are nervous going out as a rookie user. The biggest turn off for technicians could be that this gauge does not come with a case, bag or cover to make portability easier. There have been some complaints that the hoses aren’t great. For whatever reason, some users seem to have trouble establishing a vacuum through them and nothing gets drawn down from the unit. In other words, there’s a vacuum in the hose, but it collapses on itself apparently. If you are a technician in the market for a 2-way manifold gauge, this is an option but might not hold up to ongoing needs. It’s only a 3-port gauge so it’s not optimal But since you are probably carrying multiple sets of gauges anyway, this could be a good, reasonably-priced one for backup or supplemental use. Also, this apparatus is tagged with California’s Proposition 65 warning. California's Proposition 65 entitles California consumers to special warnings for products that contain chemicals known to the state of California to cause cancer and birth defects or other reproductive harm if those products expose consumers to such chemicals above certain threshold levels. We recommend using Mastercool (59161) 2-Way Manifold Set be used in a highly-ventilated area - which you’re probably doing anyway. On the whole, the Mastercool 59161 serves its purpose without any hassle. Mastercool offers a one-year warranty on this product. It warrants this product against defects in material and workmanship for a period of one year. However, this warranty does not cover failure due to abuse, improper usage, neglect or progressive wear and tear. You have to send in a form with proof of purchase within 30 days of purchase for the warranty to go into effect. Service is provided through the factory only. Mastercool is one of the leading manufacturers of professional-quality A/C manifold gauge sets. The 59161 is a decent product with a couple issues but is serviceable. If you are still contemplating on different options and would like to have more information to evaluate your decision, refer to our HVAC gauge buying guide.